In a new paper publishing in the April 4, 2019 online issue of Cell, an international team of scientists led by researchers at University of California San Diego School of Medicine employed an array of next-generation sequencing and gene-editing tools, such as CRISPR, to map the molecular dependencies –and thus vulnerabilities — of pancreatic cancer stem cells. 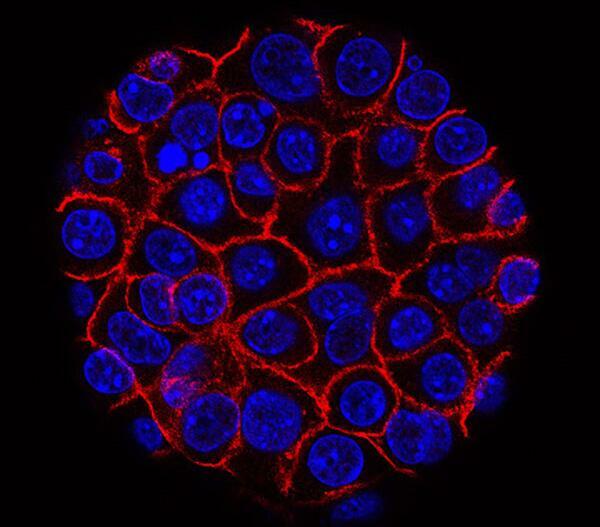 “These studies revealed an unexpected role for immuno-regulatory genes in the maintenance of the most aggressive, drug-resistant cells in pancreatic cancer,” said senior study author Tannishtha Reya, PhD, UC San Diego professor in the departments of Pharmacology and Medicine. In particular, RORγ emerged as a key regulator. RORγ rose with cancer progression and its inhibition through genetic and pharmacological approaches resulted in a striking defect in pancreatic cancer growth. Co-authors include: Nikki K. Lytle, L. Paige Ferguson, Nirakar Rajbhandari, Raymond G. Fox, Michael Hamilton, Tami Gilderman, Lourdes Adriana Esparza, Yutaka Shima and Marcie Kritzik, UC San Diego and Sanford Consortium for Regenerative Medicine; Kathryn Gilroy and Neil Robertson, University of Glasgow; Anagha Deshpande, Aniruddha L. Deshpande, and Peter D. Adams, Sanford Burnham Prebys Medical Discovery Institute; Christian M. Schurch, Stanford University; Wei Lin, Pawan Noel, Daniel Von Hoff and Haiyong Han, Translational Genomics Research Institute; Martin Wartenberg, Inti Zlobec, Micha Eichmann, Jose A. Galvan, and Eva Karamitopoulou, University of Bern; Philipp Spahn and Nathan E. Lewis, UC San Diego and Novo Nordisk Foundation Center for Biosustainability; Randall French, UC San Diego Moores Cancer Center; Kathleen M. Fisch, Roman Sasik, Sara Brin Rosenthal, Trey Ideker, and Andrew M. Lowy, UC San Diego. Funding for this research came, in part, from the National Institutes of Health (grants T32 GM007752, T32 GM007752, F31 CA206416, UL1TR001442, CA169281, R35 GM119850, CA155620, R35 CA197699 and R01 CA186043), the National Foundation for Cancer Research, the Novo Nordisk Foundation, SU2C-CRUK-Lustgarten Foundation Pancreatic Cancer Dream Team Research Grant and SU2C-Lustgarten Foundation Pancreatic Cancer Collective Grant. Disclosures: Tannishtha Reya is a consultant for Orphagen Pharmaceuticals, and received travel reimbursement from Entertainment Industry Foundation and Lustgarten Foundation. Daniel Von Hoff serves on the scientific advisory board of Five Prime and as a consultant for Celgene. Some data has been filed as a provisional patent application.